A FIGG engineer "concluded there were no safety concerns and the crack did not compromise the structural integrity of the bridge," FIU said in a statement. 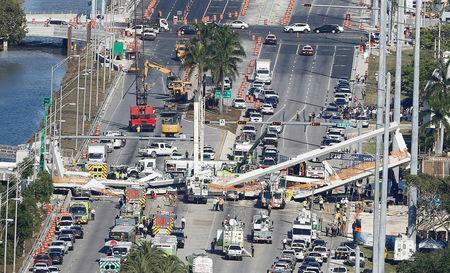 About three hours after the meeting ended, the 950-ton bridge collapsed, crushing vehicles stopped at a traffic light on the eight-lane roadway below. At least six people, including three whose bodies were recovered on Saturday, were killed. Police said four vehicles are believed to be still under the collapsed bridge and more bodies may be recovered. The victims found on Saturday were identified as Rolando Fraga Hernandez, Oswald Gonzalez and Alberto Arias, the Miami-Dade Police Department said in a statement. Police identified a fourth victim who died in hospital as Navarro Brown. Police could not be reached for further comment. News of the meeting between engineers and officials followed a revelation late on Friday that the engineer overseeing the bridge, which linked the FIU campus with the city of Sweetwater, had called a state official two days before the collapse to report cracks. In the message, Pate said his team had observed "some cracking" at one end of the bridge and that repairs were warranted, "but from a safety perspective we don't see that there's any issue there, so we're not concerned about it from that perspective."